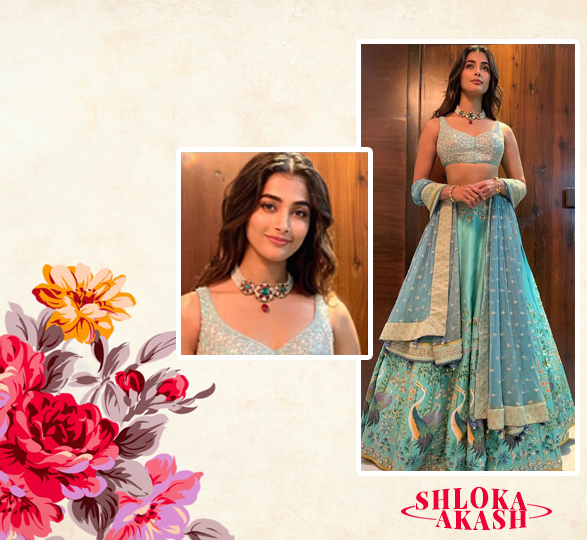 Exquisiteness magnified and a dream manifested for two beautiful people- the spring wedding season began on a flamboyant note with the big fat Akash Shloka wedding. Pictures floating all over the internet indicate every bit of pomp and while even the slightest detail has been making us go gaga, the line-up of wedding guests from B-town has us floored in totality! A plentitude of people from the Bollywood fraternity graced the ceremony to bless these cute love-birds, posing for shutterbugs in outfits that every fashion maven would love to possess. 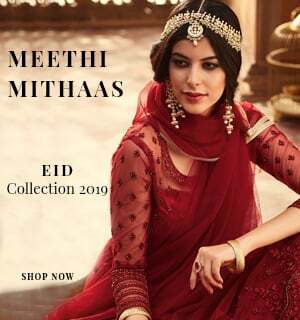 Flashing designer ensembles- truly chic and sophisticated- the event was glamorous beyond our expectations and as always, our trend-setters have given us a lot to emulate. 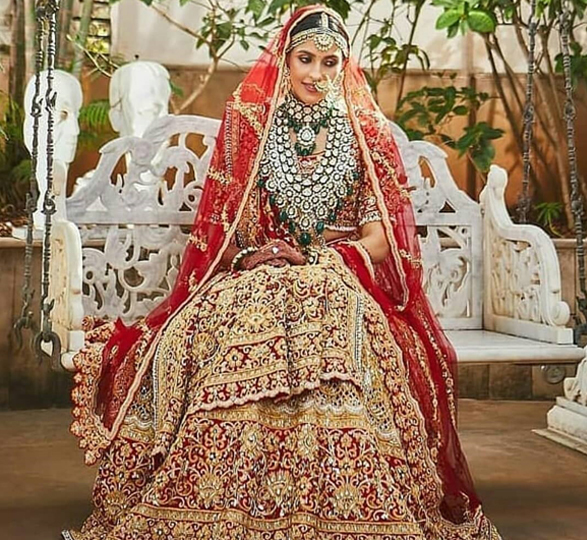 Like every other celebrity wedding- this one too was no less than a fashion runway and but there was beautiful change – this wedding broke the ongoing rage of following dress codes- leaving the guests with ample choice to explore and flaunt the best of their wardrobe. The usual festive wardrobe bling seemed a little toned down this time as compared to other recent celebrity weddings- most of our divas were seen wearing soft tones, pastels and neutrals. While some of them stood out by wearing flashy outfits- overall the colour palette during at the jamboree was quite subdued. Glossy silks in soft neutrals made another prominent detail at the myriad of events. Vidya Balan graced the occasion in a white silk saree paired with a red embroidered add-on and while her outfit was a little bland, we loved the dupatta add-on! Karisma Kapoor too underplayed her wardrobe and walked in wearing a cream half-and-half saree which had a serene look with a touch of jazziness. 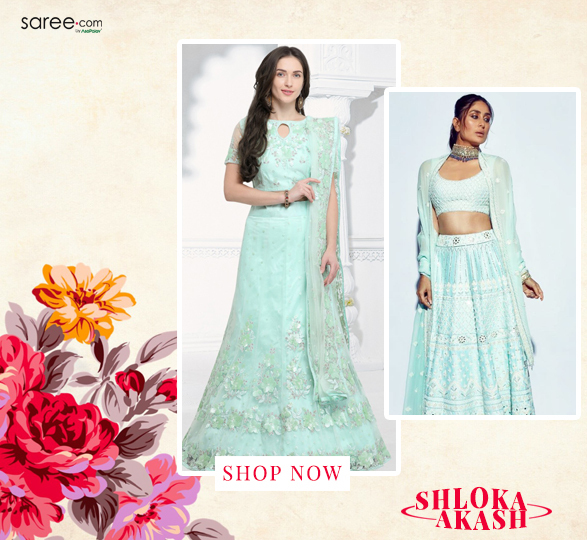 Pastel lehenga cholis– less detailed and elegant- were also one of the most commonly spotted ensembles. Kareena Kapoor, Priyanka Chopra, Kiara Advani and Pooja Hedge were some of the prettiest pastel clad delights at the wedding. Pretty to the core- pink is the official trending colour of the season. 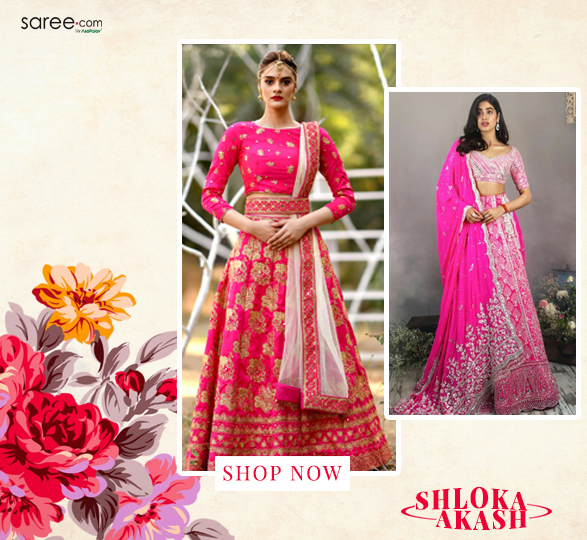 Gorgeous ladies Janhvi Kapoor and Kriti Sanon both turned up wearing similar looking outfits- pink mirror work lehenga cholis. In an industry where exclusivity is a top priority this twinning look was quite a breather for us- now that’s a cute coincidence, isn’t it? 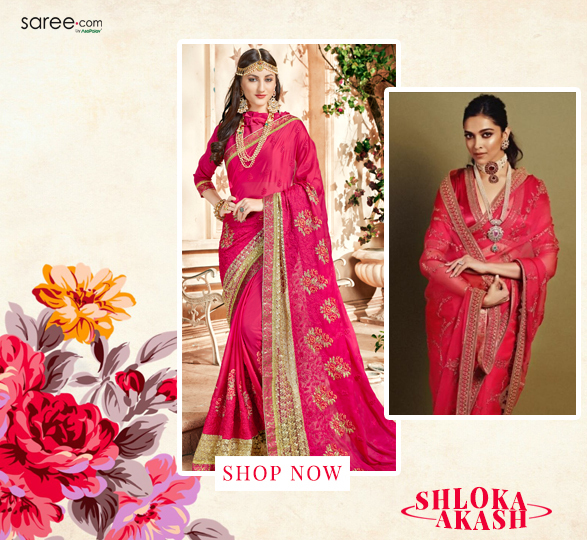 The usually outstanding Shilpa Shetty Kundra went in for a salmon pink embroidered saree– looking dressy with understated glamour. 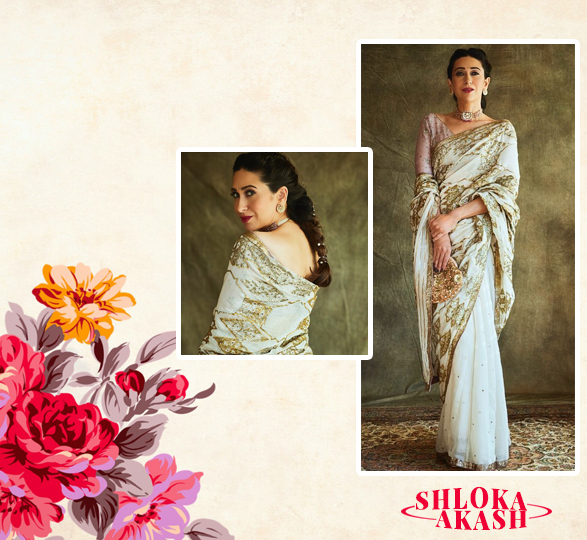 A relatively simple saree for an event so grand, this one had a jewel neckline satin silk bustier blouse that held up her oomph score. Deepika Padukone was dressed up like a queen- draped in a traditional pink saree with regal pearl jewellery and was a sight to behold. Actress Poonam Dhillon was also spotted in a pink ombre saree while some of the other ladies joining the pink tribe were Mira Kapoor, Ananya Birla and Arundhati Bhattacharya- the former chairman of State Bank of India. Replacing 3D ornamentation with bewitching prints was a smart move made by Katrina Kaif to break the monotony of festive-wear ostentation. 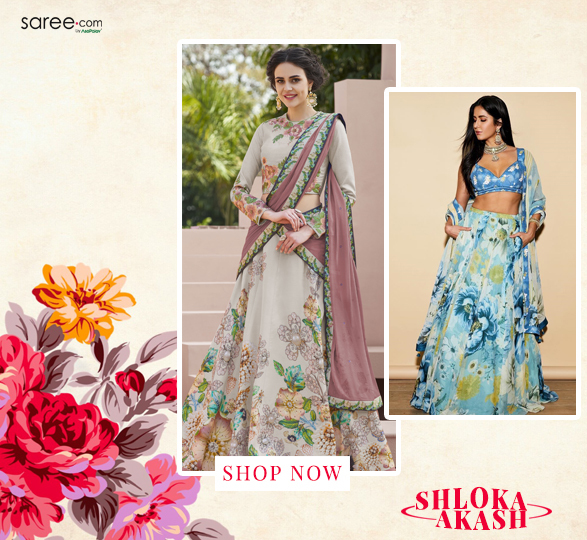 Kat wore a floral printed lehenga choli with a floral concoction of green and blue. Joining Katrina with the print game was Pooja Hedge who wore a blue lehenga choli with enthralling bird motif prints- an outfit that was quite a statement in itself! 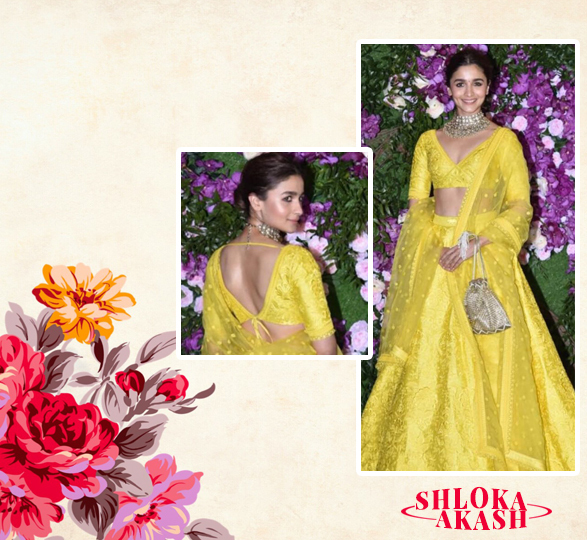 We usually see this dimpled girl in peppy tones and this wedding was no exception- Alia was captured wearing a yellow lehenga choli at Akash Ambani’s wedding. That was quite a bright colour for the occasion, but the subtlety of details made a good balance. 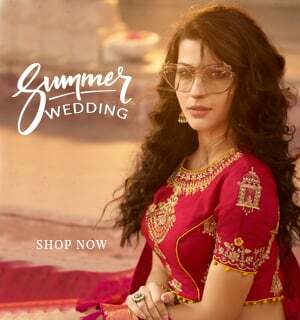 Diana made an enticing entry in a contemporary designer lehenga choli– a sensuous black corset blouse paired with a sequined black and pink lehenga. Adding to the exquisiteness of her ensemble was a statement ruffled dupatta which was layered in black, pink and metallic grey. 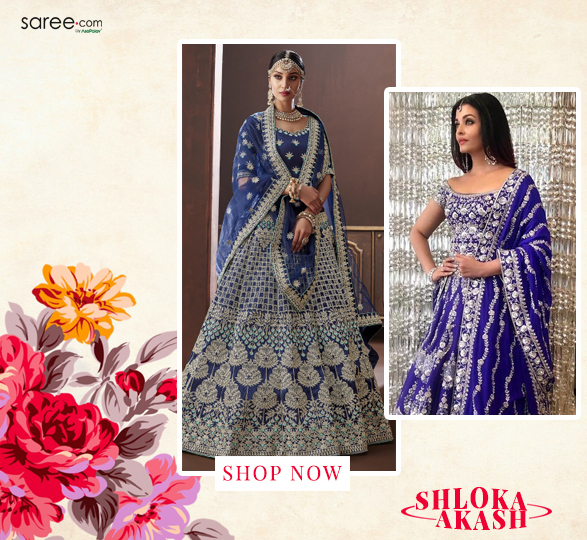 The light-eyed supreme diva of Bollywood was on the border-line of being flashy- Aishwarya’s vibrant blue embroidered lehenga choli was quite basic but the colour stood out against the pool of bland tones- quite pleasingly odd! 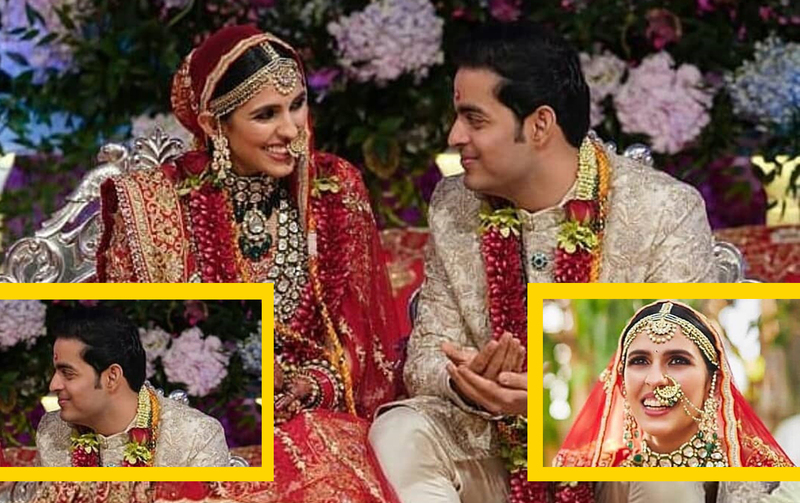 So these were some of our favourites from the celebrity guest-list of the luxurious Ambani wedding. We look forward to more of such fascination from the ever-buzzing world of Bollywood! Kasavu Love – Gold and Cream Traditional Saree Makes Waves….